Embodied Biotensegrity Online is your source for learning from biotensegrity pioneers and connecting with others from the comfort of your own home or anywhere that you have access to the internet. We will be bringing you online courses, webinars and an online membership group. Susan Lowell de Solorzano, author of the upcoming book: Everything Moves: How Biotensegrity Informs Human Movement. 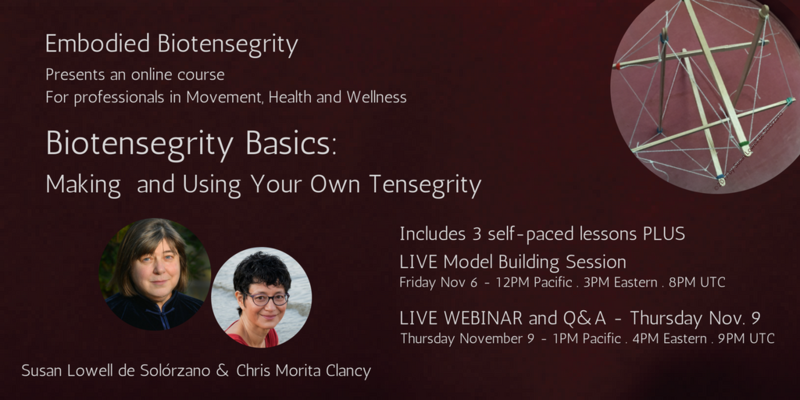 Plus you can join us on Facebook now for a safe to ask questions, find resources and learn about Embodied Biotensegrity Online offerings. Join Susan Lowell and me on our first course Biotensegrity Basics: Making and Using Your Own Tensegrity Or send me an email if you’d like to gather a group and host a session. I hope to see you there, or in our facebook group.